The Aurora had already had a busy and eventful early life before being involved in any kind of Antarctic expedition proving her strength and sea worthiness in the stormy Northern and sub-Arctic seas. Originally built as a sealer for the Dundee fleet and strongly built for that purpose as she was likely to meet ice. The hull was made of oak, sheathed with greenheart and lined with fir. The bow was a mass of solid wood re-enforced with steel-plate armor. The heavy side frames were braced by two levels of horizontal oak beams. 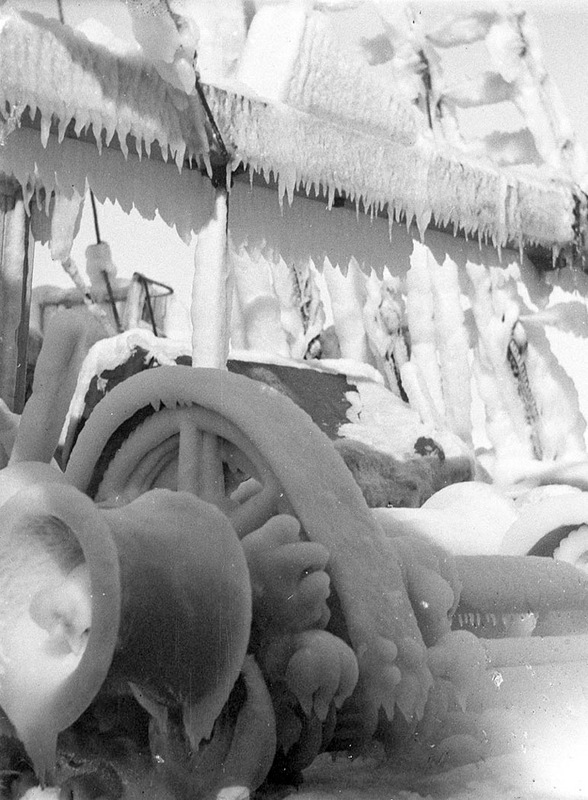 Iced-up machinery following rough seas and low temperarures that froze sea spray on the deck. 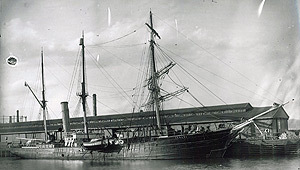 The Aurora was purchased by Douglas Mawson in 1910 as his expedition ship for the The Australasian Antarctic Expedition that left Hobart for Antarctica on the 2nd of December 1911. Characteristically for expeditions at this time in wooden sailing ships with auxiliary engine power, the rough seas encountered caused anxieties. The first night the wind rose to a full gale. Large quantities of deck cargo began moving around and the crew had their work cut out to secure the lashings in the teeth of the storm. A plug in one of the fresh water tanks was washed away and seawater rushed in resulting in the drinking supply being rationed afterwards. Rough weather continued for the next few days and a huge wave carried away one side of the bridge (fortunately without any loss of life). Eventually the weather abated and on December 11th Macquarie Island was sighted. At the northern end of the island they came across the crew of a recently wrecked ship, the Clyde who could be returned to civilization by the auxiliary vessel, the Toroa. Establishing a base on Macquarie Island was the first objective of the expedition, a base hut and wireless station were soon erected with the Aurora leaving a party of men here sailing again for the south on 23rd December. 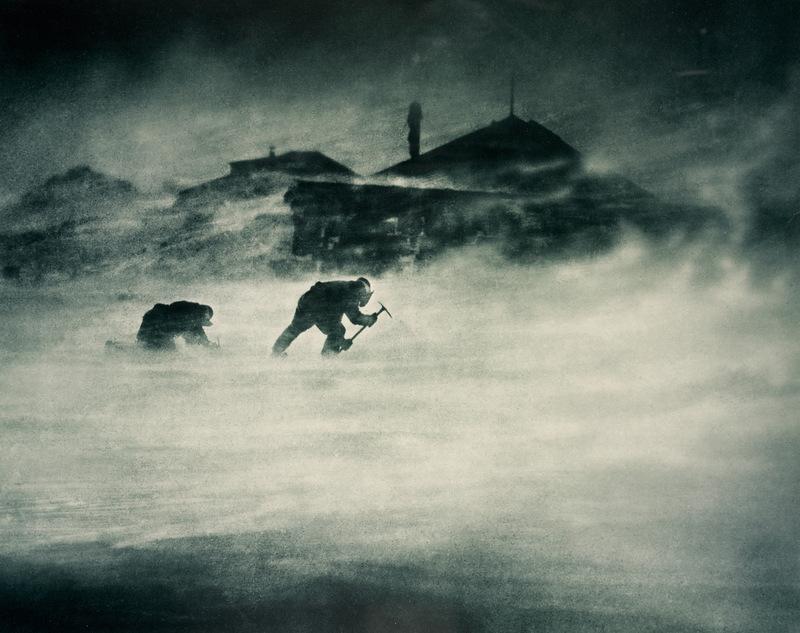 They reached a place that Mawson named Commonwealth Bay on January 7th 1912. A boat was lowered and rowed towards shore. This was an area of a great concentration of wildlife, Weddell seals and Adelie penguins were abundant, the latter in thousands. This was the only point on the Antarctic continent that anyone had stood on in a distance of about 2000 miles, it was named Cape Denison and became the center of operations for the expedition. Mawson's base camp was established at Commonwealth Bay, on the Antarctic coast almost due south of Hobart, to where the Aurora returned. She left in order not to be frozen in and subjected to the damaging winter winds and sea-ice and also to be able to bring fresh supplies the following spring. On her return she found that Mawson and two companions, Mertz and Ninnis had left base camp on a long sledging trip, but had not yet returned and were well overdue. Captain J. K. Davis, the ship's master, anchored in whatever shelter he could find beneath the ice cliffs, near the main Commonwealth Bay base, until either the land party returned or the ship had to depart. With only rock and kelp to hold an anchor, this was a dangerous place to be. Even under full steam the ship was in danger of being blown backwards by hurricane winds blowing from the pole, that could gust to 80 knots and more. On two occasions, these winds caused the anchor chain to fail and much valuable chain was lost. The ship sailed away up the coast to a hopefully less treacherous area moving back to the base whenever possible to unload further supplies, but a third time a terrific gust of wind caused the anchor chain to part. By the end of January 1913, Captain Davis had decided to leave a small winter party of six men at the base at Commonwealth Bay and start on the return voyage to Hobart before the sea froze and trapped them. Mawson meanwhile was making his way back to the base against tremendous odds and as he reached Cape Denison he saw a departing speck on the horizon - the Aurora leaving Antarctica for the season. He was greeted by the six who had remained to search for the sledging party as though he were saved from the dead, which was not far from the truth. They tried to recall the Aurora by radio but ice conditions prevented her from returning and the seven men at Cape Denison resigned themselves to another winter of blizzards and confinement. They were well stocked with supplies however and even made a sledge journey the following spring. On December 12th 1913 the Aurora returned. 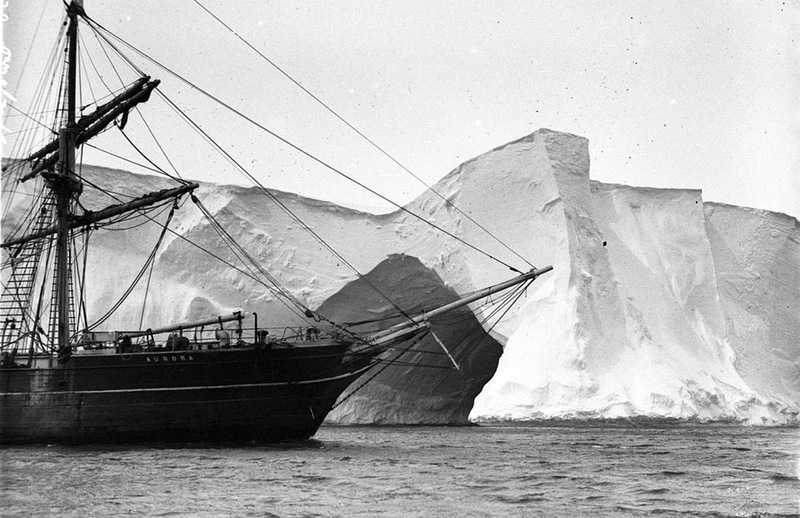 By December 24th, their two-year expedition was over and on February 5th, 1914 the Aurora set sail for Australia. Trans-Antarctic Expedition 1914-1917, Sir Ernest Shackleton. 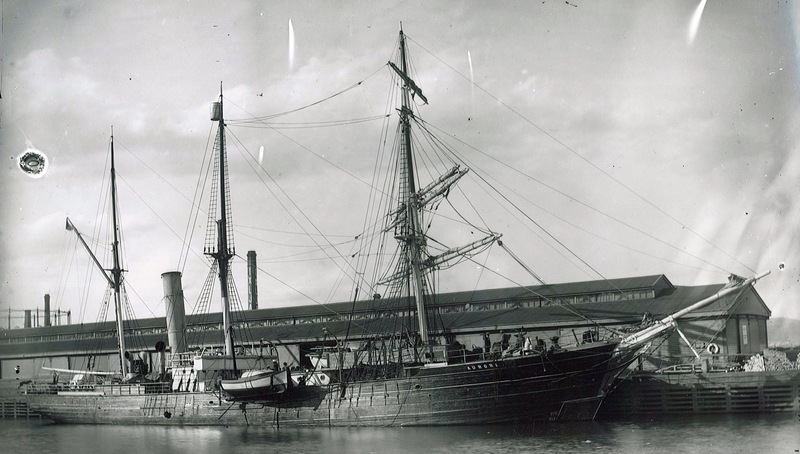 The Aurora did not stay away from Antarctica for long, after a refit in Sydney she was used by Sir Ernest Shackleton in 1914-1916 for transporting and supplying the "Ross Sea Party" for his Trans-Antarctic Expedition. This party were to lay depots of food and supplies for Shackleton and his team who were to attempt to cross the Antarctic continent from one side to the other via the South Pole. The Aurora sailed into McMurdo Sound to be confronted with and delayed by heavy pack ice. On January the 16th 1915 she was able to begin unloading stores to be left in a depot. She continued to work her way south as far as possible, she anchored to the sea ice when she could proceed no further and began unloading supplies for sledging depots. Several groups of men set off with sledges to establish depots and to try to reach Hut Point where Scott had made his base in 1902. The ship was kept off Tent Island though there were continual problems with the pack breaking away meaning that the ice anchors would not hold properly. Over the next month, the ship moved around in the vicinity of Cape Evans before being able to reach Discovery Bay on March the 12th and drop anchor. More provisions were unloaded and one of the earlier sledging parties was taken back aboard the ship. The intention was for the ship to spend the winter in the relatively safe waters of McMurdo Sound. On May the 6th 1915 a blizzard hit the area blowing ice away from the shore and parting mooring chains that were holding the ship in place. The Aurora was stuck fast in the sea ice and taken out to sea into McMurdo Sound with it. She drifted helplessly in the pack laden with stores and provisions that were badly needed for the winter and also to enable the shore parties to lay the depots for those walking across the continent via the pole. Little did any of the men in the Ross Sea area know that by now Shackleton's party and the Endurance were enduring an enforced winter stuck in the pack ice of the Weddell Sea, pack ice that was to eventually crush and sink the ship. No-one would ever come to collect the supplies from the depots that they were to so diligently lay at a great cost of life and limb. The Aurora was low on coal and drifting with the sea ice, the days were very short and midwinter was approaching. The best those on board could hope for was to drift towards the North East and push through the pack towards New Zealand. There was an intensity and desperation to get back to laying the depots across the continent for the South Pole Party who were never to come. There was little that could be accomplished however, attempts were made to radio Macquarie Island so that messages could be passed but with no success. Contingency plans were made in case the ship were nipped in the ice. The 18 men on board planned to take to sledges with rations and set off across the ice to reach the nearest land. On June the 8th 1915 the ship's log says "Made our latitude 75° 59'S. by altitude of Sirius. This is a very monotonous life, but all hands appear to be happy and contented. The temperature is -20° Fahr." Later that month the ship looked like it was going to be broken by the ice and readiness was made to abandon her, but she was allowed a reprieve and continued to drift until the 12th of February 1916 when the ice finally broke up around her finally releasing the Aurora back to the sea. She was able to sail north and was towed into Port Chalmers near Dunedin New Zealand, by a tug she encountered en route, arriving on the 3rd of April. 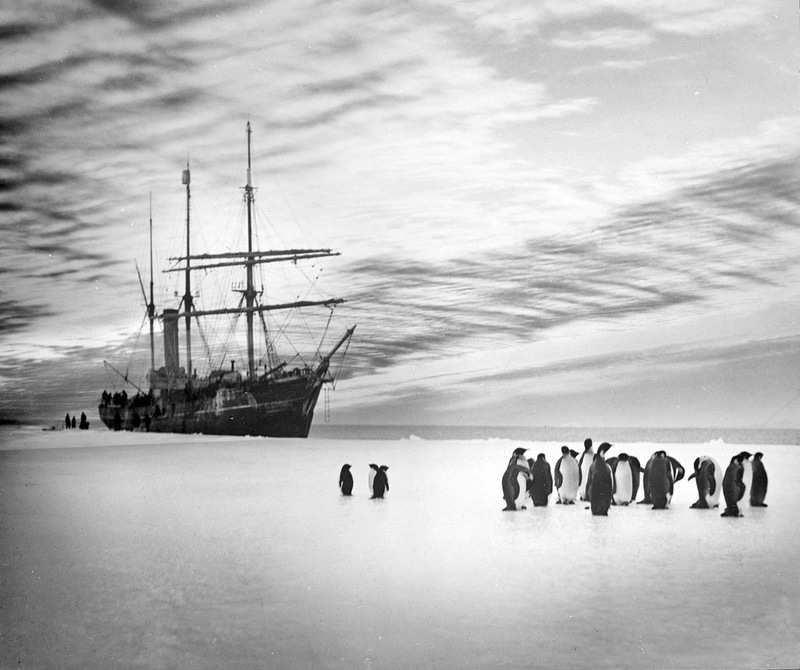 Shackleton reached New Zealand at the beginning of December, 1916. By now the Aurora had been repaired and refitted. 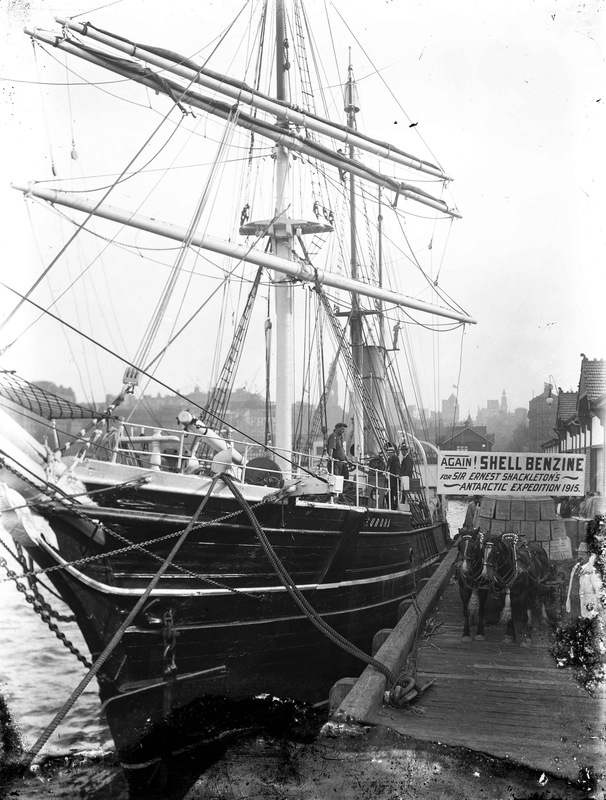 He sailed on the Aurora from Port Chalmers on December the 20th, 1916, for McMurdo Sound. They encountered the first ice a week later and entered the open water of the Ross Sea on January the 7th, 1917. Shackleton went ashore at Cape Royds with a party to look for any records possibly left in the hut. A letter was found stating that the Ross Sea Party was housed at Cape Evans. Shackleton was on his way back to the ship when six men, with dogs and a sledge, appeared in the direction of Cape Evans. At 1p.m. this party arrived on board and Shackleton learned that of the ten members left behind when the Aurora broke away on May the 6th 1915, only seven had survived. The Aurora arrived in Wellington New Zealand on February the 9th. Three anchors and some anchor cable lying at the bottom of Commonwealth Bay are the only known remains of the Aurora.